Crosland Group, the developer of the ultra-luxurious yet affordable mixed-use project ilume™, announced today the opening of the development's leasing office. ilume, the first green built apartment building in Dallas, will anchor the western end of the Cedar Springs Entertainment District and comprise 23,000 square feet of retail space and 316 luxury apartments offering boutique hotel amenities. 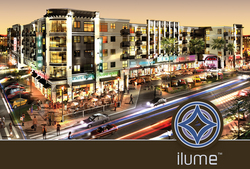 The new ilume leasing center is located at 3922 Cedar Springs Road, Dallas, TX, 75219 and can be reached at 214-520-0588. Center hours are: Tuesday thru Wednesday - 10 a.m. to 7 p.m.; Thursday thru Saturday - 4 p.m. to 12 a.m. (usually til 2 a.m.) and Sunday - 2 p.m. to 7 p.m.
"ilume sets a new standard for luxury urban living in Dallas," said Ryan Baldwin, ilume marketing director. "Extraordinary design by Travis Terry Designs - both inside and out - combined with impeccable service, a rich menu of amenities and array of exciting restaurants and retail is now just steps away from some of the best in nightlife that Dallas has to offer. ilume, the first green built apartment building in Dallas, is a five-story, self-contained, mixed-use development that will house 316 apartments and offer cafes with bar and outdoor patio seating, restaurants, essential shops, service retail and lifestyle shopping with front door parking, two-way drive-thru and direct accessibility to the garage. A signature Kroger store provides walkable grocery shopping across the street. "ilume is not just an apartment, but a way of living, and our initial leasing inquiries have exceeded expectations," said Baldwin. "When our residents come home, they need not drive again for groceries, banking, dinner or drinks. Every basic need is within walking distance of the ilume." 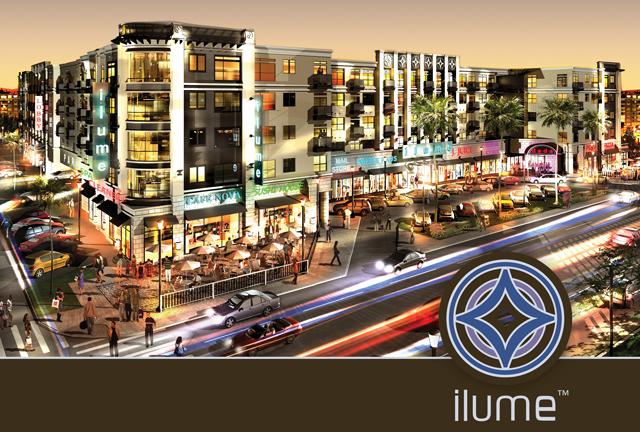 Numerous residential leases are being signed for phase one of the ilume development. New residents will be able to move-in beginning July 1st. The apartments, leased at market rates, begin on the first floor (with 15-foot ceilings and stained concrete floors) along the east, south and west sides of the property and fill the upper floors. Over 7,000 square feet of amenity space will include a boutique hotel-style chandeliered lobby with concierge, game lounge with Poker/Wii Room, the signature Champagne Lounge, Great Room, business center with WiFi, fitness center, yoga/spin room, pet grooming facility and tanning room. Vast outside entertaining spaces will include the courtyard with outdoor kitchen and cabana bar, double lap pool with Acapulco deck, sheer descents, water cannons, extra-large hot tub, fire pit, dance floor with outdoor theater and surround cabana lounges and grill area. Based in Dallas, TX and founded in 1975, the Crosland Group is an investment builder of incoming producing properties through related entities active on a regional basis. Projects have been produced throughout the United States, including Tennessee, South Carolina, Maryland, North Carolina, Florida, Texas, Arizona, Colorado and California. These projects have included free standing retail facilities, warehouses, regional shopping centers, industrial parks, office buildings, luxury apartments, condominium towers and residential sub-divisions. ilume™, the first green built apartment building in Dallas, is a five-story, self-contained, mixed-use development housing 316 luxury apartments and 23,000 square feet of retail space that includes cafes with bar and outdoor patio seating, restaurants, essential shops as well as service retail and lifestyle shopping. The complex offers front door parking, two-way drive-thru and direct accessibility to the garage. Residents are offered over 7,000 square feet of boutique hotel quality amenity space; including chandeliered lobby with concierge, game lounge with Poker / Wii Room, a signature Champagne Lounge, Great Room, business center with WiFi, fitness center, yoga/spin room, pet grooming facility and tanning room.